Do not pull the release lever while the vehicle is in motion. Otherwise, the hood could be forced open by passing air flow. This could cause the hood to come loose and injure you and/or others. Do not open the hood when the engine is overheated. You could be seriously injured. Observe the coolant temperature display to determine whether the engine may be overheated. If you see flames or smoke coming from the engine compartment, move away from the vehicle. Wait until the engine has cooled. If necessary, call the fire department. There is a risk of injury if the hood is open, even if the engine is not running. Some engine components can become very hot. To avoid the risk of burns, only touch those components described in the Operator's Manual and observe the relevant safety notes. To help prevent personal injury, stay clear of moving parts when the hood is open and the engine is running. The radiator fan may continue to run for approximately 30 seconds or may even restart after the engine has been turned off. Stay clear of fan blades. – Make sure that the windshield wipers are switched off. The windshield wipers and wiper linkage could be set in motion. 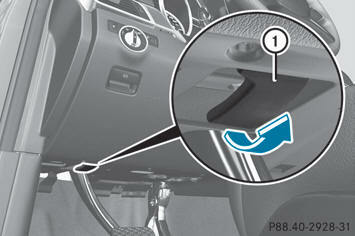 When the hood is open, you or others could be injured by the wiper linkage. Make sure that the windshield wipers are switched off. Remove the SmartKey or make sure that no ignition position has been selected with KEYLESS-GO. All indicator lamps must be off in the instrument cluster. – Pull release lever 1 for the hood. – Reach into the gap, pull hood catch handle 2 up and lift the hood. Once you have lifted the hood about 15 inches (40 cm), it is automatically opened the rest of the way and held open by the gas-filled struts. When closing the hood, use extreme caution not to catch hands or fingers. Be careful that you do not close the hood on anyone. Make sure the hood is securely engaged before driving off. Do not continue driving if the hood can no longer engage after an accident, for example. The hood could otherwise come loose while the vehicle is in motion and injure you and/or others. – Lower the hood and let it fall from a height of approximately 8 inches (20 cm). – Check that the hood has engaged properly. Vehicles with a diesel engine: do not cover the radiator, for example with a winter front or bug cover. The readings of the on-board-diagnostic system may otherwise be inaccurate. Some of these readings are required by law and must be accurate at all times. Depending on the driving style, the vehicle consumes up to 0.9 US qts. (0.8 l) of oil over a distance of 600 miles (1000 km). The oil consumption may be higher than this when the vehicle is new or if you frequently drive at high engine speeds. – Park the vehicle on a level surface. To check the oil level with the engine at operating temperature, switch the engine off and wait for approximately five minutes. – Pull oil dipstick 1 out of the dipstick guide tube. – Wipe off oil dipstick 1. – Slowly slide oil dipstick 1 into the guide tube to the stop, and take it out again. If the level is between MIN mark 3 and MAX mark 2, the oil level is correct. – If the fuel level has sunk to MIN mark 3 or below, add 0.55 to 1.1 US qt (0.5 to 1.0 l) engine oil. If engine oil comes into contact with hot engine parts, it may ignite and you could burn yourself. Do not spill any engine oil on hot engine parts. Environmental note When adding oil, take care not to spill any. If oil enters the soil or waterways, it is harmful to the environment. Use only engine oils and oil filters that have been approved for vehicles equipped with a service system. A list of the engine oils and oil filters tested and approved in accordance with the Mercedes-Benz Specifications for Service Products can be called up by visiting http://www.mbusa.com (USA only). More information about tested and approved engine oils and oil filters is available from any authorized Mercedes-Benz Center. Damage to the engine or exhaust system is caused by the following: - using engine oils and oil filters which have not been specifically approved for the service system. - replacing the engine oil or oil filter after the replacement interval required by the service system has elapsed - using engine oil additives. Do not add too much oil. If the oil level is above the "max" mark on the dipstick, too much oil has been added. This can lead to damage to the engine or the catalytic converter. Have excess oil siphoned off. – Turn cap 1 counterclockwise and remove it. If the oil level is at or below the MIN mark on the oil dipstick, add 0.55 to 1.1 US qt (0.5 to 1.0 l) engine oil. 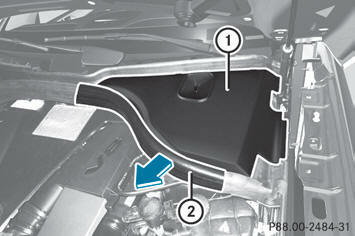 – Replace cap 1 on the filler neck and turn clockwise. Ensure that the cap locks into place securely. – Check the oil level again with the oil dipstick. Further information on engine oil. – Turn the SmartKey to position 2 (Y page 139) in the ignition lock. On vehicles with KEYLESS-GO, press the Start/Stop button twice. – Check the coolant temperature gauge in the multifunction display. The coolant temperature must be below 158 °F (70 °C). In order to avoid any potentially serious burns: - use extreme caution when opening the hood if there are any signs of steam or coolant leaking from the cooling system, or if the coolant temperature display indicates that the coolant is overheated. - do not remove the pressure cap on the coolant reservoir if the coolant temperature is above 158 °F (70 °C). Allow the engine to cool down before removing the cap. The coolant reservoir contains hot fluid and is under pressure. - using a rag, slowly turn the cap approximately 1/2 turn to relieve excess pressure. If opened immediately, scalding hot fluid and steam will be blown out under pressure. - do not spill antifreeze on hot engine parts. – Slowly turn cap 1 half a turn counterclockwise and allow excess pressure to escape. – Turn cap 1 further counter-clockwise and remove it. If the coolant is approximately 0.6 in (1.5 cm) above marker bar 3 in the filler neck when warm, there is enough coolant in coolant expansion tank 2. 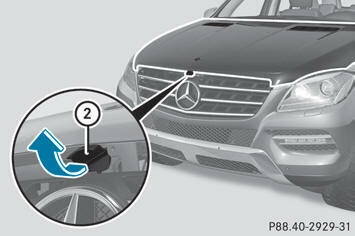 – If necessary, add coolant that has been tested and approved by Mercedes-Benz. – Replace cap 1 and turn it clockwise as far as it will go. Vehicle components and their service products must match. You should, therefore, only use products that have been tested and approved by Mercedes-Benz. Information on tested and approved products can be obtained at any authorized Mercedes-Benz Center or on the Internet at http://www.mbusa.com (USA only). At temperatures below freezing: always fill the washer fluid reservoir with a mix of water and windshield washer concentrate (e.g. MB WinterFit). There is otherwise a risk of damaging the windshield washer system/headlamp cleaning system. Only use washer fluid concentrate which is suitable for plastic lenses. 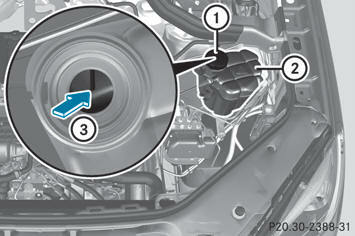 Unsuitable washer fluid concentrate could damage the plastic lenses of the headlamps. Add windshield washer concentrate, e.g. MB SummerFit, to the washer fluid all year round. – Mix the windshield washer fluid in a container beforehand. – At temperatures above freezing: fill the washer fluid reservoir with a mix of water and windshield washer concentrate (e.g. MB SummerFit). – At temperatures below freezing: fill the washer fluid reservoir with a mix of water and windshield washer concentrate (e.g. MB WinterFit). Adapt the mixing ratio to the outside temperature. For information on the mixing ratio. – To open: pull cap 1 upwards by the tab. – Add the premixed washer fluid. – To close: press cap 1 onto the filler neck until it engages. If you notice that the brake fluid level in the brake fluid reservoir has fallen to the MIN mark or less, check the brake system immediately for leaks. Also check the thickness of the brake linings. Contact a qualified specialist workshop, e.g. an authorized Mercedes-Benz Center immediately. Only check the brake fluid level when the vehicle is stationary and on a level surface. 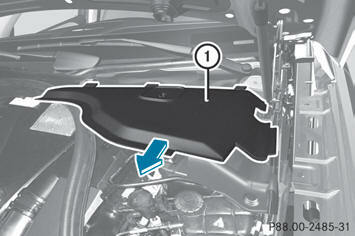 In order to check the brake fluid level, the cover above the brake fluid reservoir must be removed. – Remove seal 2 in the area around cover 1 in the direction of the arrow. – Raise cover 1 at the front. – Pull out cover 1 in the direction of the arrow. The brake fluid level is correct if it is between MIN marking 4 and MAX marking 3 on the brake fluid reservoir. Cover 1 is installed in the reverse order. When doing so, make sure that the guides of cover 1 engage in the slots in the bulkhead.